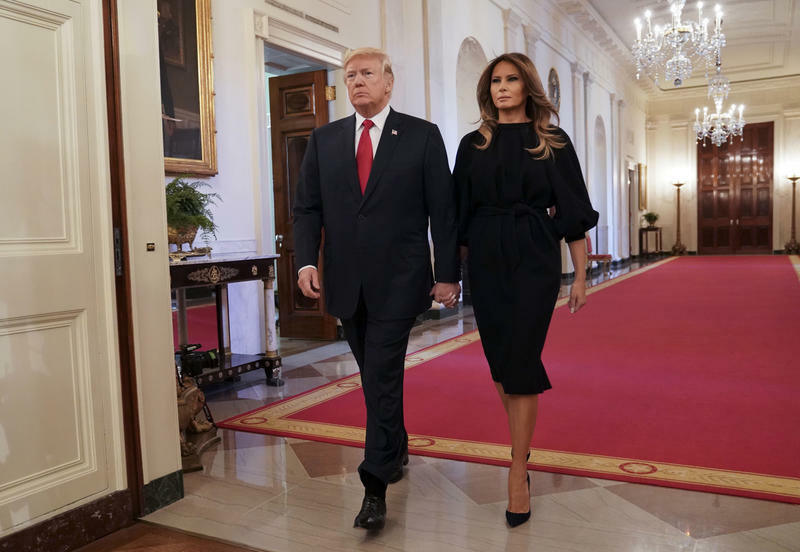 President Donald Trump and First Lady Melania Trump walk in to speak on the opioid crisis in the East Room of the White House in Washington, Thursday, Oct. 26, 2017. President Donald Trump outlined on Thursday his long-awaited plan to address the opioid crisis as a national public health emergency. Part of that plan was based on experiences in the Ohio Valley region. In an address at the White House Thursday both President Trump and First Lady Melania Trump mentioned efforts in the Ohio Valley region to help infants affected by the crisis. Trump said that a hospital nursery in West Virginia treats one in every five babies for symptoms of addiction. “Because these precious babies were exposed to opioids or other drugs in the womb,” he said. According to data from the West Virginia Health Statistics Center, 5 percent of babies born in West Virginia last year were born drug-affected. First Lady Melania Trump spoke about her recent visit to a Huntington, West Virginia, treatment center for infants and mothers called Lily’s Place. Lily’s Place director Rebecca Crowder was in the audience for the address. The president’s public health emergency declaration could encourage additional resources for treatment facilities. The White House has not yet released details of the emergency plan or how the programs will be funded. The rate of deaths from opioids in West Virginia, Kentucky and Ohio is more than twice the national average. On average last year, 15 people died each day in the three-state region from opioid overdoses.